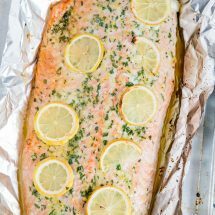 My Easy Baked Salmon recipe is our family’s go-to recipe! Topped with a simple honey garlic butter and lemon, this easy salmon recipe is sure to become your new go-to as well! Salmon is on our menu almost weekly, and my kids absolutely love it. In fact my daughter loves salmon so much she has eaten it every single night on every cruise we’ve taken. Unfortunately restaurants just can’t get away without overcooking the salmon it seems and it usually comes out a little on the dry side. Luckily, that won’t happen at home when you follow my easy steps for how to bake salmon perfectly every time! Salmon is an easy fish to cook. It’s delicate, but also holds up well to different cooking methods, from baking, to broiling, to frying to grilling. For this easy salmon recipe we are taking the baked route – it’s the most preferred in our household, and coincidentally, the easiest! You do have to be careful not to overcook the salmon. Overcooking results in a dry and stringy flesh that’s just not as pleasant to eat. I cook my salmon at 400 degrees for about 15 minutes. There seem to be varying schools of thought on this, utilizing various cooking temperatures and times, but this method has always yielded a moist and tender salmon for me, that’s light pink in color and never overcooked. 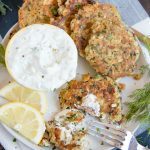 While this flavor combo happens to be one of my favorites, you can use other simple options such as fresh lemon with parsley or dill or just salt and pepper. What kind of salmon should I buy? There are generally two types of salmon available in my grocery store (and likely in yours, too) Wild Caught and Farm Raised. But what’s the difference? Raised in aquatic farming types of operations, rather than in the wild. Higher in fat, which gives it a milder flavor and makes it a little more forgiving if you overcook it a little. Typically cheaper than other varieties of salmon. Like the name says, this type of salmon is caught fisherman style out in the big ol’ ocean. Salmon fishing is a popular activity for travelers on Alaskan cruises! Has a deeper, more red/orange color and is leaner, as more fat is used in the wild to help regulate body temperature. This also results in a more richer, fishier flavor. Because it’s usually provided by small business fisherman operations, the price tends to be higher. 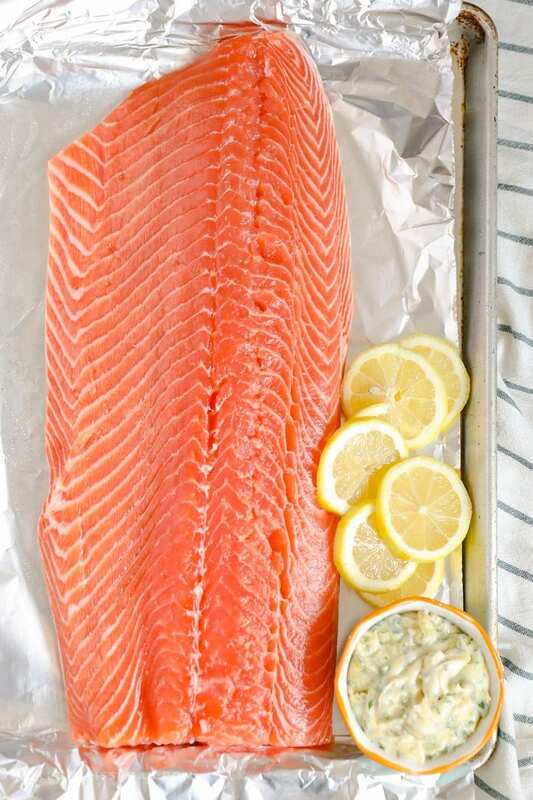 We prefer the milder, farm raised salmon, but both are delicious and will taste great when you’re baking salmon. 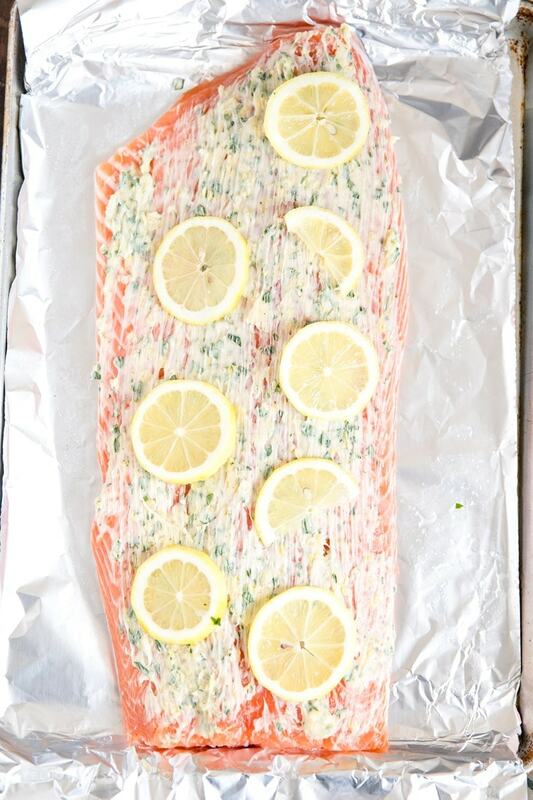 To make Easy Baked Salmon, start by laying out a salmon filet on a foil covered baking sheet. Season with salt – not too much as it can quickly overpower the fish. You can also add more after cooking. Mix up the honey garlic butter by combining softened (room temp) butter, minced garlic, minced parsley, honey and lemon zest. Slather that all up and down the fish. Top the honey garlic butter with some lemon slices. Bring up the sides of the foil to form a sort of “pan” that will keep the yummy butter and juices right in there with the fish. You can spoon them over the fish once it’s cooked if you like or serve it on the side for dipping. It doesn’t take too long to bake salmon – just about 20 minutes at 400 degrees. 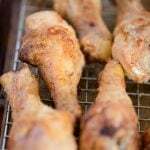 If you have a meat thermometer (aff), it will come in handy here. You want the internal temp of the fish to be about 125-140 degrees. Some people prefer their baked salmon on the lower end of that scale, at a medium rare, and some prefer their salmon to be well done. I’m somewhere in between! How do you like your salmon? 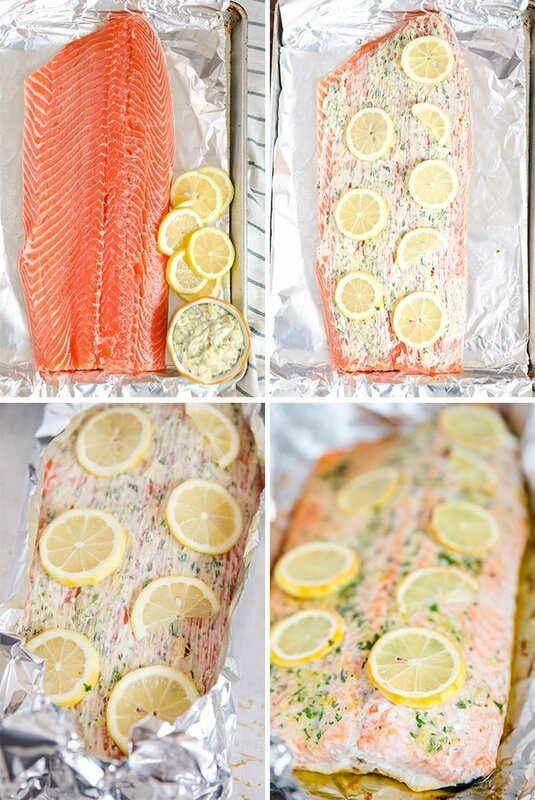 My Easy Baked Salmon recipe is our family's go-to recipe! 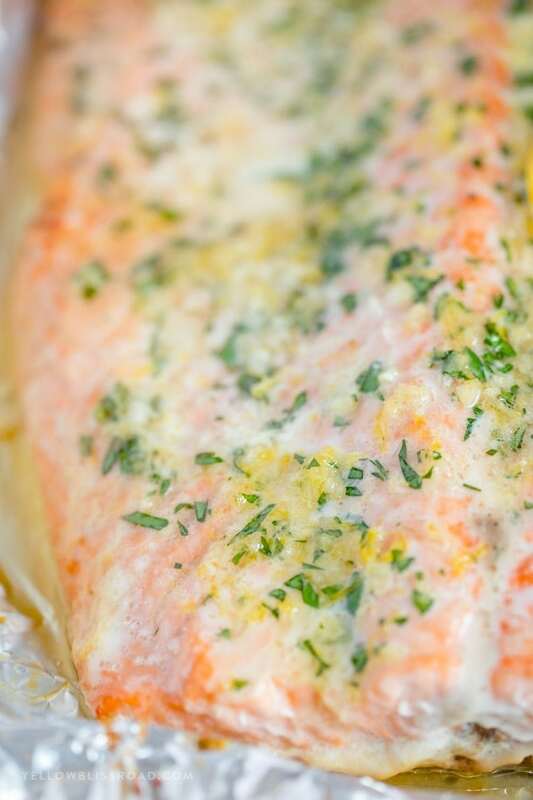 Topped with a simple honey garlic butter and lemon, this easy salmon recipe is sure to become your new go-to as well! 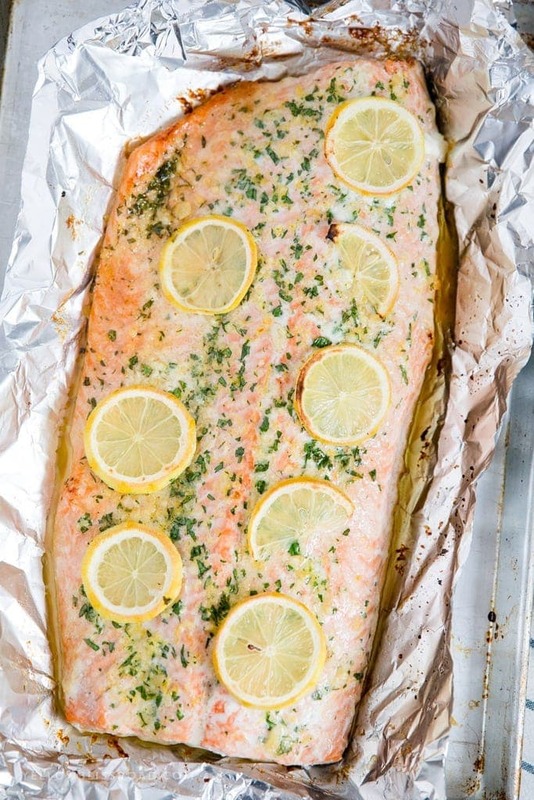 Preheat oven to 400 degrees F. Line a large rimmed sheet pan with foil. Lay the salmon skin side down on the foil. In a small bowl, combine softened butter, honey, garlic, lemon zest and minced parsley. 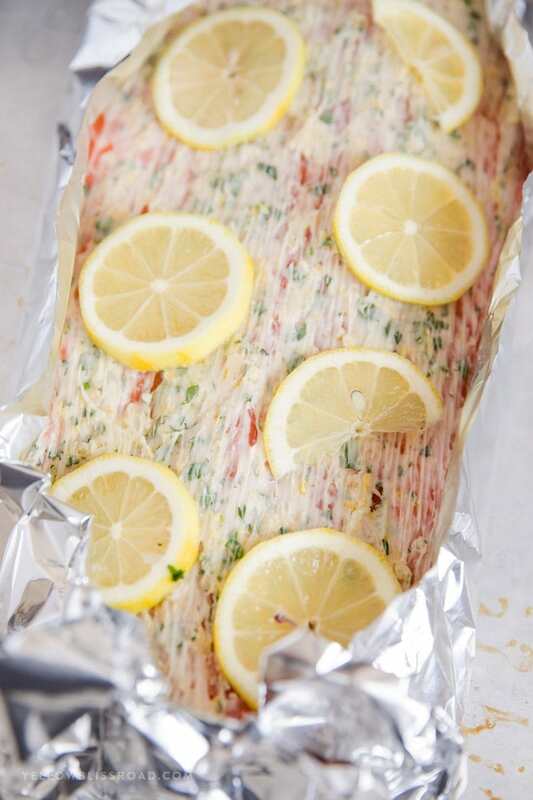 Spread evenly over the top of the fish, then top with lemon slices. 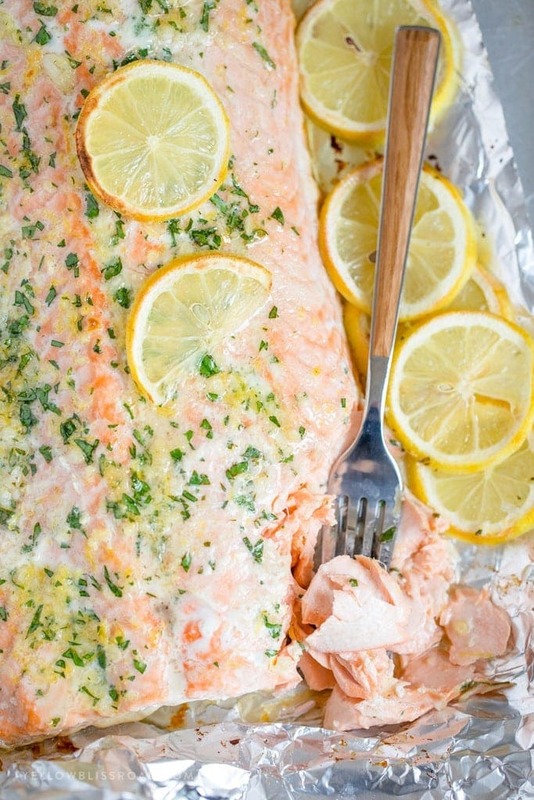 Bring up the sides of the foil around the salmon. This will help keep the juices from spilling all over the pan. Covering the salmon completely is ideal, but not a must. Remove from the oven and let rest for several minutes before serving. Serve with extra lemon wedges, if desired. Nutritional facts do not include the honey or butter since it melts and a lot of it is left in the pan. Hi Kristin. 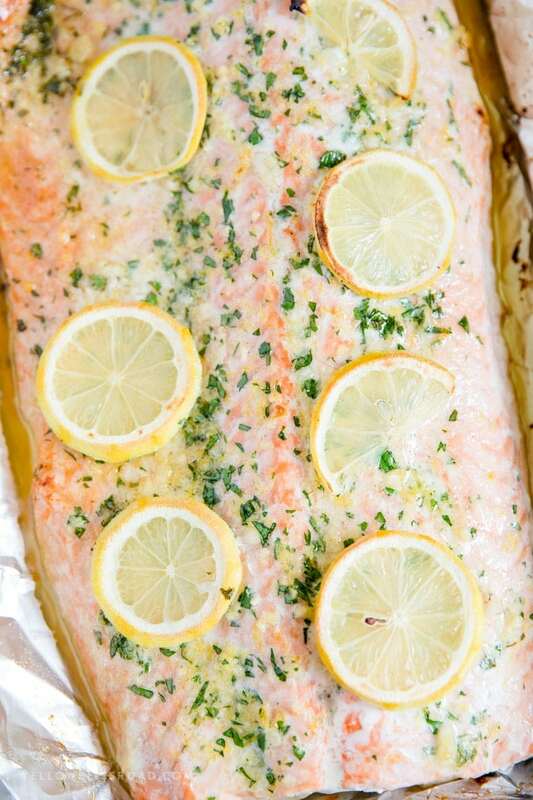 I just made your easy baked salmon and you’re right, it’s the best salmon I’ve ever eaten. I also prefer the farm raised salmon. I think the wild is way too fishy tasting. Thanks for the great recipe! Thank you April! I’m glad you enjoyed it!